The D5900-2 Fiberglass Extension Ladders feature a rounded rail for improved ergonomics while climbing and carrying equipment. 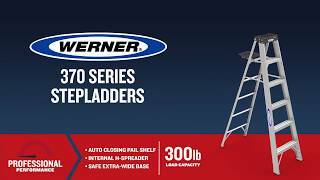 These extension ladders are lightweight for transporting and maneuvering yet still have a duty rating of 225 pounds. The FS100 Series single sided Fiberglass Step Ladders have a duty rating of 250lb and a multi-functional HolsterTop® to keep tools organized and safe on the ladder. 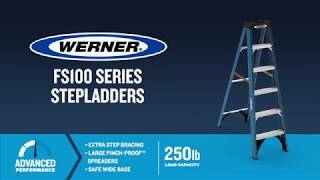 These ladders work indoors and outdoors, on the jobsite or for home applications. The NXTIA00 Series Fiberglass single sided Step Ladders are loaded with advanced features. The multi-functional HolsterTop® PRO keeps tools organized and safe on the ladder top. These ladders are great for electrical jobs. New features and a robust 300lb load capacity maximizes productivity. 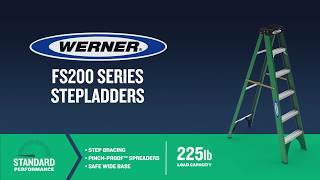 The FS200 Series single sided Fiberglass Step Ladders have a duty rating of 225lb and a multi-functional HolsterTop® to keep tools organized and safe on the ladder. 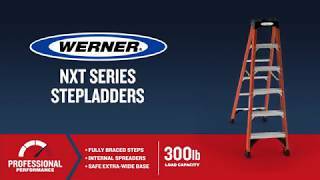 These ladders work indoors and outdoors, on the jobsite or for home applications. 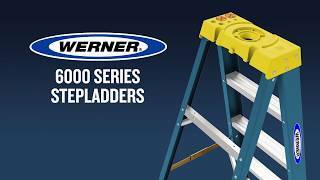 The 5900 Series Fiberglass Step Ladders have a duty rating of 225lb with braces on the top step and top horizontal. Featuring a high performance HolsterTop® with a paint and tool holder, these ladders are great for homeowners or professionals. Fiberglass rails are non-conductive for working near electricity. The 6200 Series Fiberglass Step Ladders are ideal for the homeowner or the professional. With a duty rating of 300lbs, they feature a HolsterTop® with the Lock-In System to secure tools from falling while keeping them right at hand. Fiberglass rails are non-conductive for working near electricity. 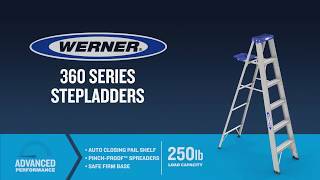 The 6000 Series Fiberglass Step Ladders feature a HolsterTop with the Lock-In System that allows you to customize your ladder top. These step ladders have a duty rating of 250lbs and offer EDGE® bracing for enhanced strength and increased protection against damage. The fiberglass rails are non-conductive for working near electricity. 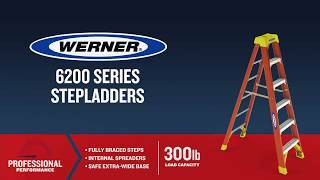 The 350 Series Aluminum Step Ladders have a duty rating of 225lb and TOOL-TRA-TOP® that feature a convenient tray for holding tools or a paint can and slots for a paint roller tray. 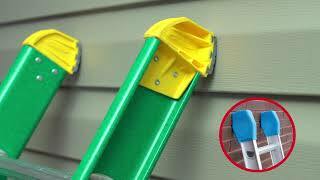 There is also a sturdy molded paint can hanger on the back of the top. The lightweight aluminum makes it easy to carry and great for painters and contractors. The 370 Series Aluminum Step Ladders have a duty rating of 300lb. The TOOL-TRA-TOP® has a drill holster, convenient tray for tools/paint and small parts. There is also a sturdy molded paint can hanger and a SPILL-PROOF® pail shelf with a rag rack to hold a gallon of paint. The lightweight aluminum makes it easy to carry and great for painters and contractors. 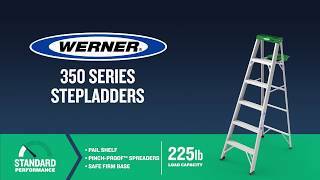 The 360 Series Aluminum Step Ladders have a duty rating of 250lb and TOOL-TRA-TOP® that feature a convenient tray for holding tools or a paint can and slots for a paint roller tray. The lightweight aluminum makes it easy to carry and great for painters and contractors. See the entire video collection!